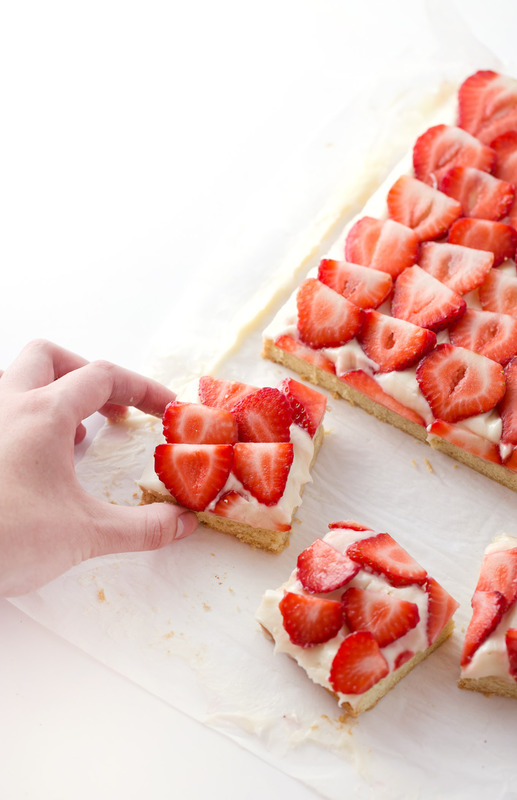 This easy sugar cookie fruit pizza can be made in a 9×13 pan, making it the perfect quick dessert for crowds! 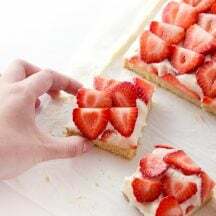 It’s a soft, thick, and chewy sugar cookie base topped with a luscious cream cheese frosting and fresh strawberries (and WAY better than the premade Pillsbury dough you’ve probably have before!). 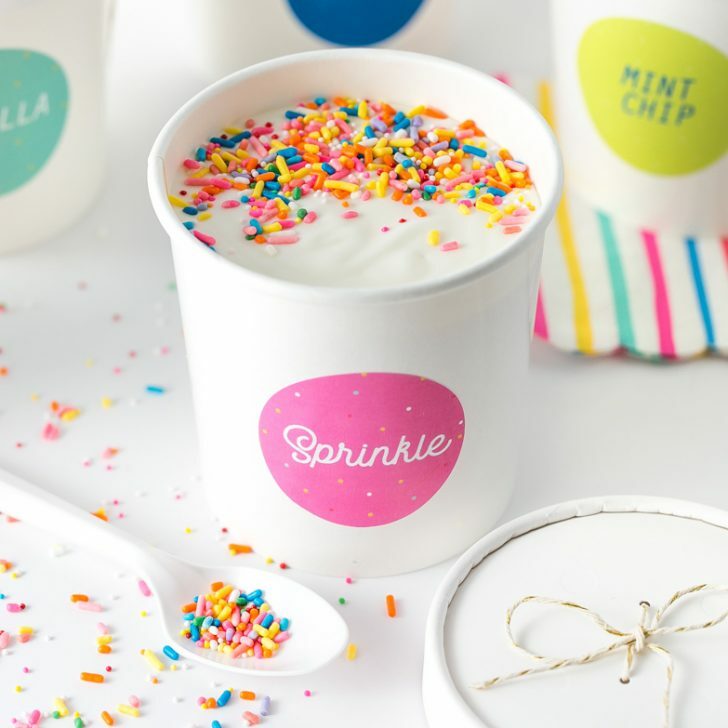 Perfect for barbecues, summer parties, Fourth of July, baby showers, or whenever you need to take a dessert to a potluck! Ever since I was little, some form of sugar cookie fruit pizza has made its way into family gatherings or potlucks. 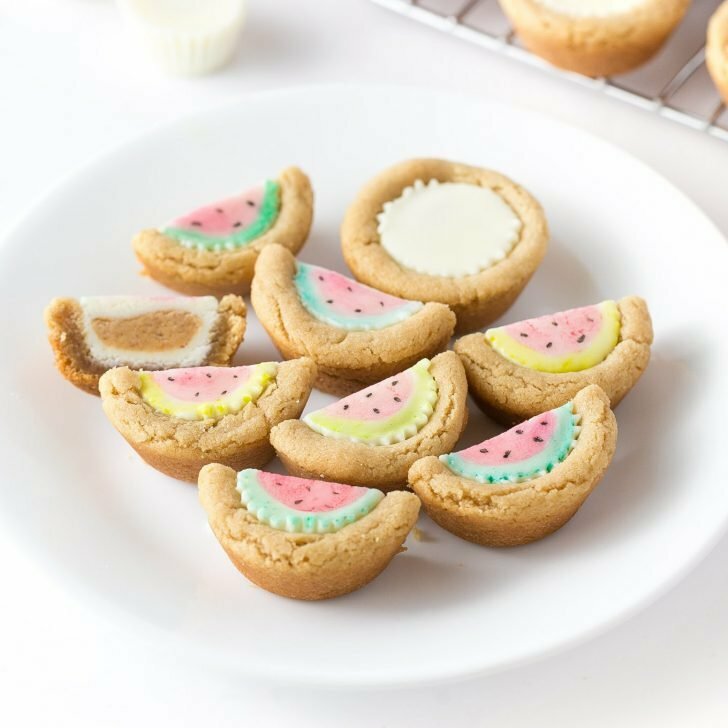 Most of the time topped with various fruits and store-bought Pillsbury sugar cookie dough. And while I understand the ease of store bought dough, I just can never get behind the taste and texture. It’s always a little too artificial and the dough always seems to be dry. So today, I’m ditching all the unnecessary toppings like canned clementines and sliced grapes (no thanks) and sharing with you my IDEAL fruit pizza made from scratch. 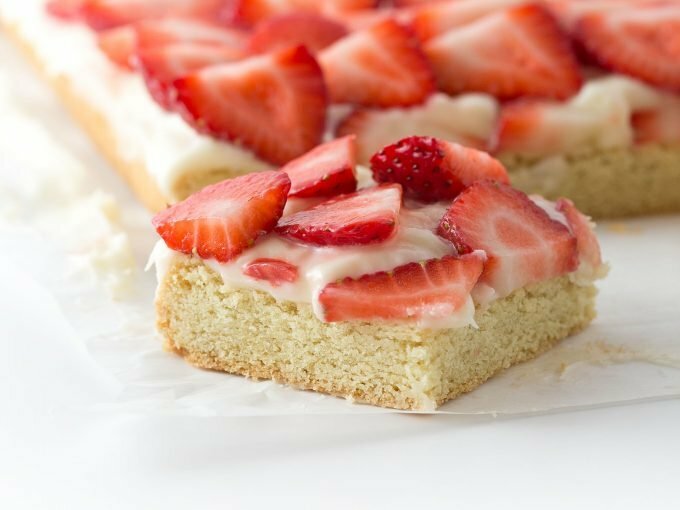 A thick, soft sugar cookie base topped with homemade cream cheese frosting (with lemon if you please) and loads of fresh strawberries. Because why waste time and money with “fruits just to fluff” when the strawberries are the best part, anyways? Tip: Looking to make your fruit pizza without cream cheese? 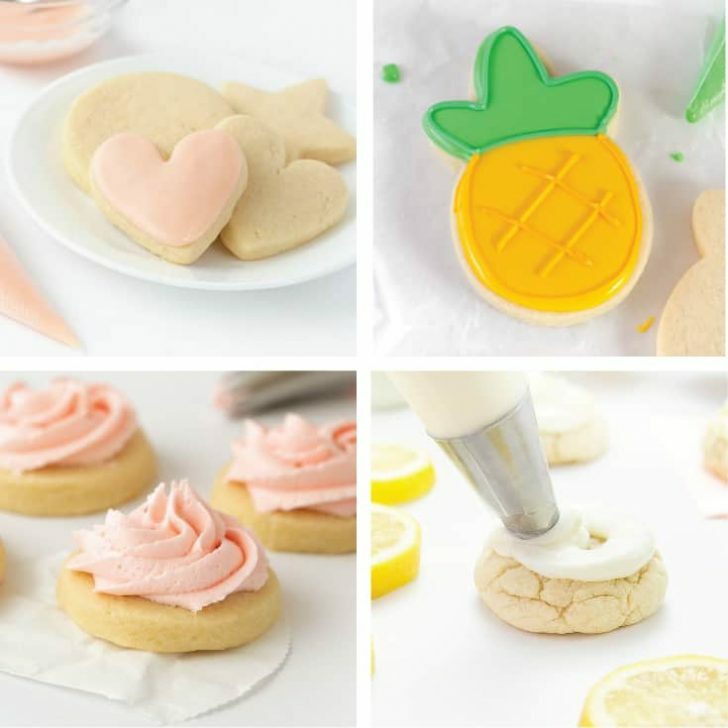 You could also use a sugar cookie buttercream, although I do really like how the cream cheese gives it a tangy taste that pairs nicely with the fruit. 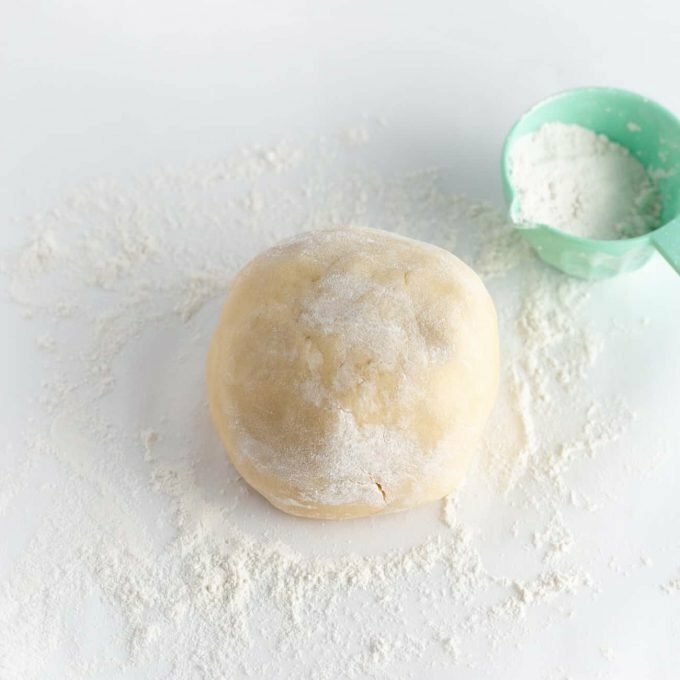 Mix the dough according to the instructions below then knead into a ball. Lightly grease a 9×13 pan with butter or non-stick baking spray then cover the pan in 2 sheets of horizontal parchment paper (having the grease underneath the paper will help the paper stay down). Pull apart the dough into 1 tablespoon sized chunks and place in the pan. Use your hands or a spatula to press down the dough until it covers the pan. 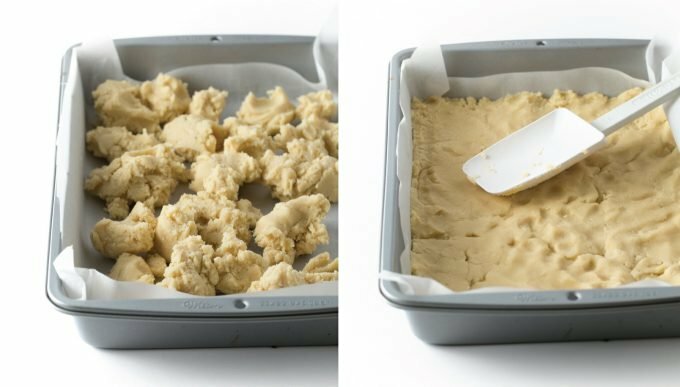 Tip: If the dough is sticky, you can place another piece of parchment paper on top and continue pressing down. 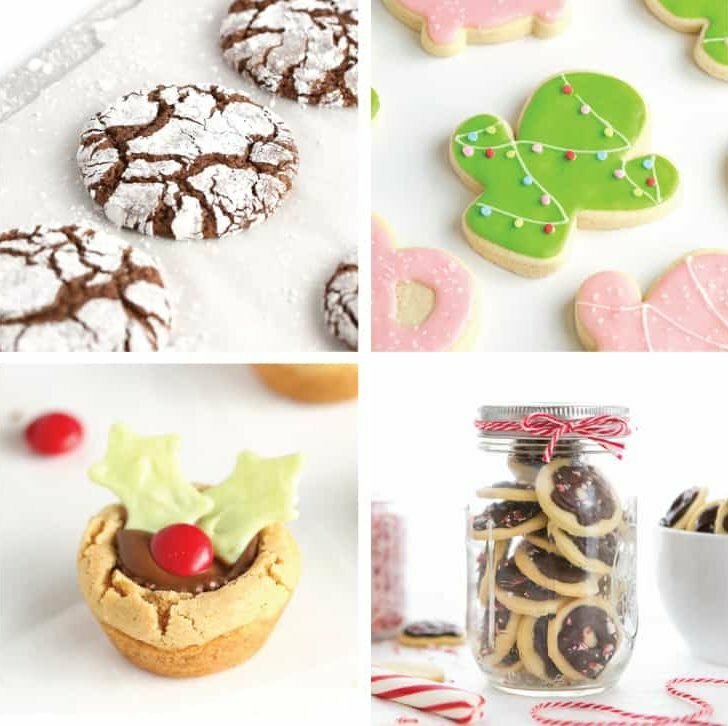 Bake and let cool completely before frosting. 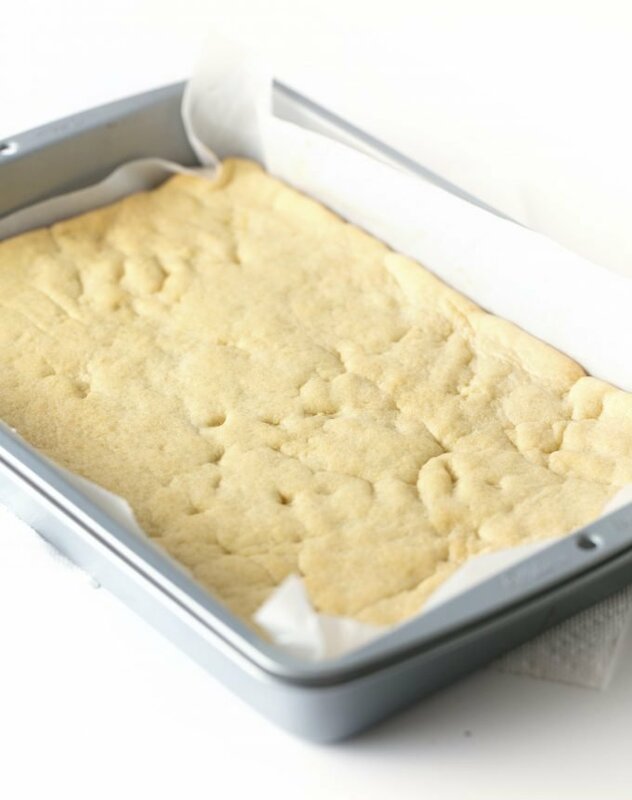 The trick to soft sugar cookie bars is to take them out before you start to see brown on the edges. 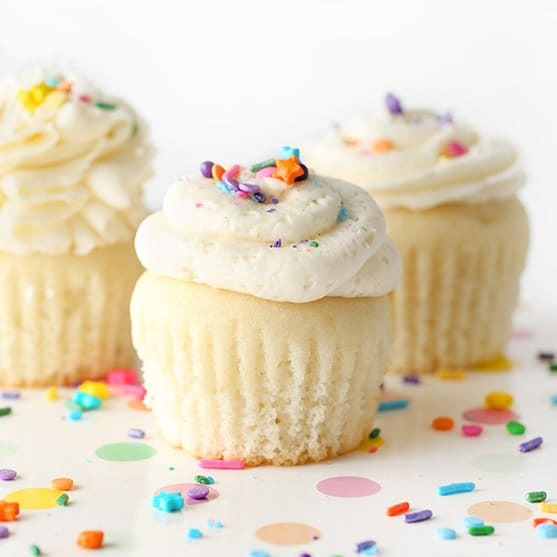 While the dough is baking, make the frosting. To do so, beat the cream cheese and butter with an electric mixer for 2-3 minutes until light and fluffy. Add in vanilla, lemon extract and powdered sugar and beat for another 2 minutes. 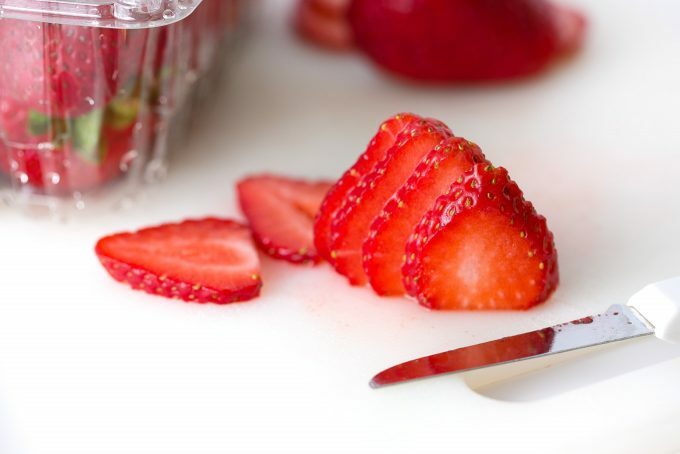 Use a small knife to remove stems, then slice strawberries into slices. As you’ll see below, you want to cut them from the top down (not from side to side) to get the prettiest cuts. Once the sugar cookie bars are fully cooled, spread the cream cheese frosting on top (it will be thick!) 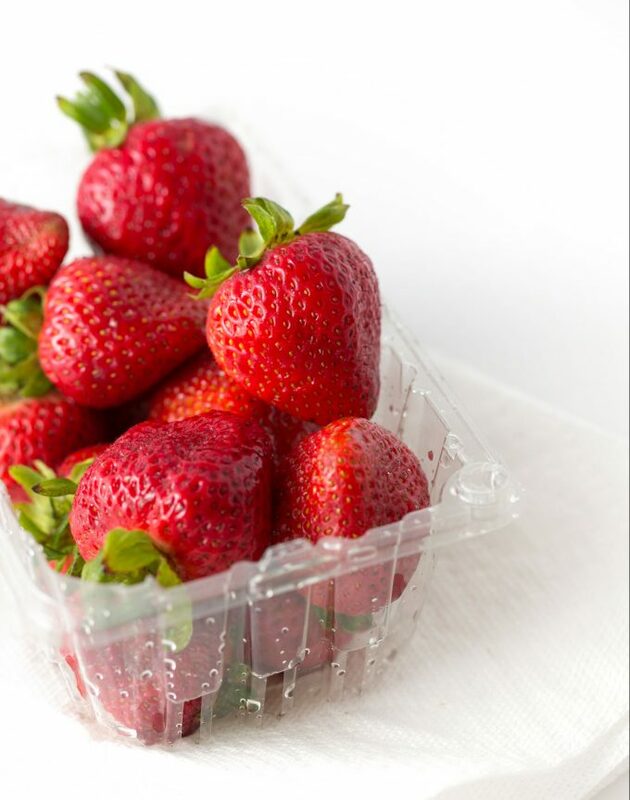 then top with the fresh berries. 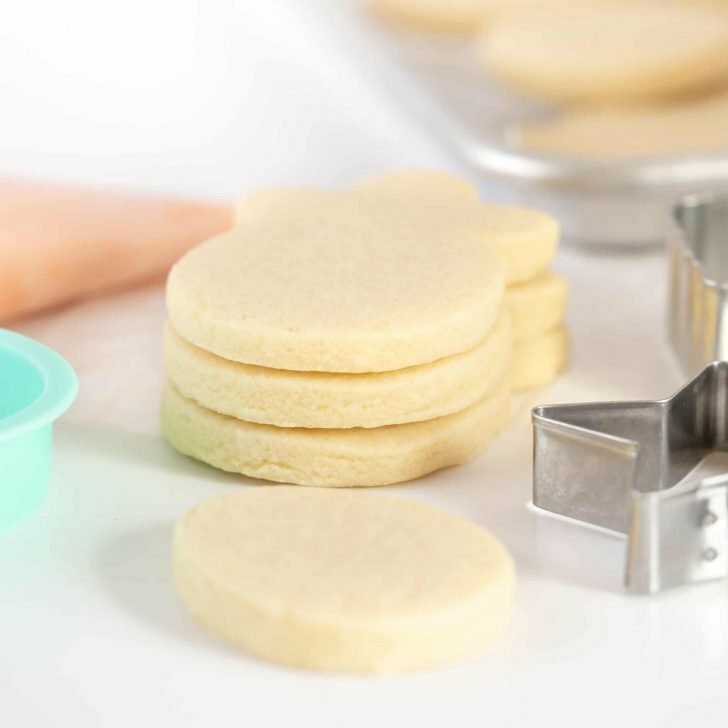 Tip: To make them easier to cut and serve, gently lift the parchment paper up to remove the bars from the pan. This will allow you to use a large knife to cleanly cut through. For the best presentation, wipe the edge of a knife on a warm wash rag in between each cut. 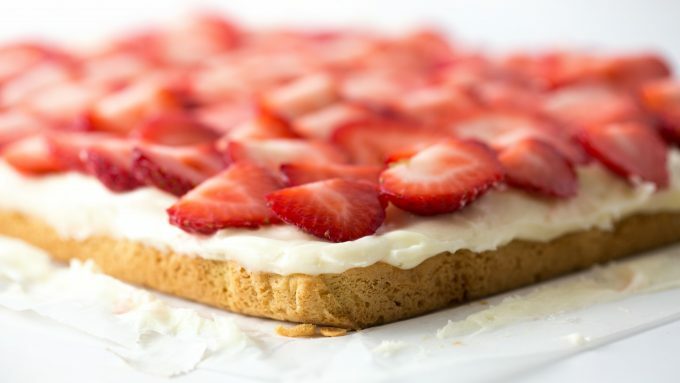 A soft, thick, and chewy sugar cookie fruit pizza topped with cream cheese frosting and fresh strawberries (aka. WAY better than premade Pillsbury dough). Preheat oven to 350 degrees. 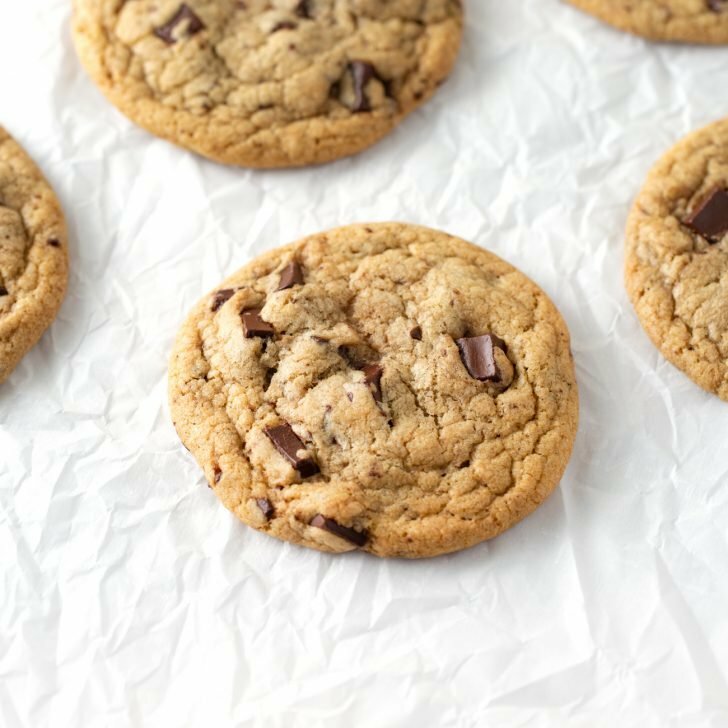 Lightly grease a 9x13 pan with butter or non stick baking spray then cover the pan in parchment paper (having the grease underneath the paper will help the paper stay down). 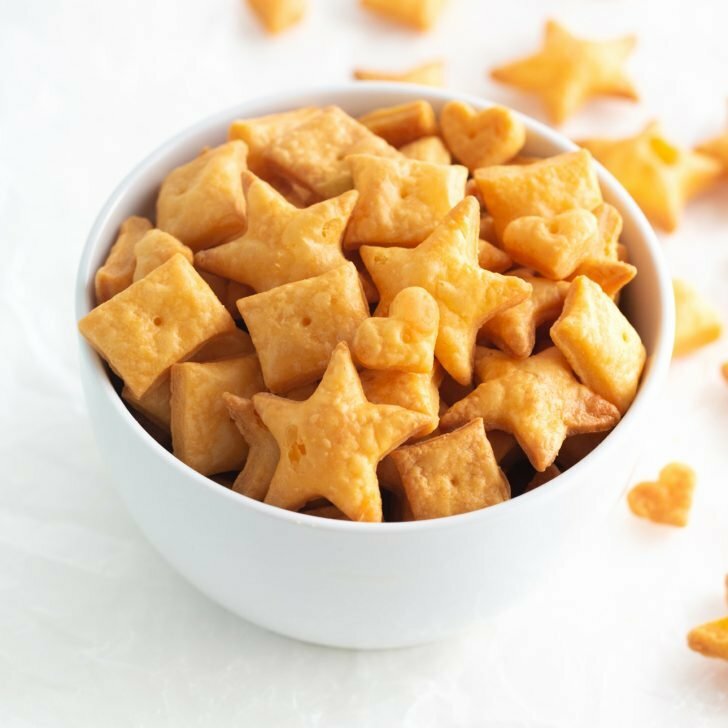 Pull apart the dough into 1 tablespoon sized chunks and place in the pan. In a large bowl, cream together butter and sugar on medium speed for 20-30 seconds. While mixer is still on medium speed, add in egg, vanilla and almond extract. Once mixed, add in baking powder, salt, and *flour. (Add flour 1/2 cup at a time on low speed). Once mixture is combined and all the flour disappears, transfer dough to the piece of floured parchment paper. Press mixture into large ball so that it is all incorporated and any loose floury pieces are pressed in. Bake at 350 degrees for 12-14 minutes. Do not overbake. I recommend removing the pan from the oven before seeing any brown on the edges. Once completely cooled, top with frosting and fresh berries. Store in refrigerator, covered, container for 2-3 days. 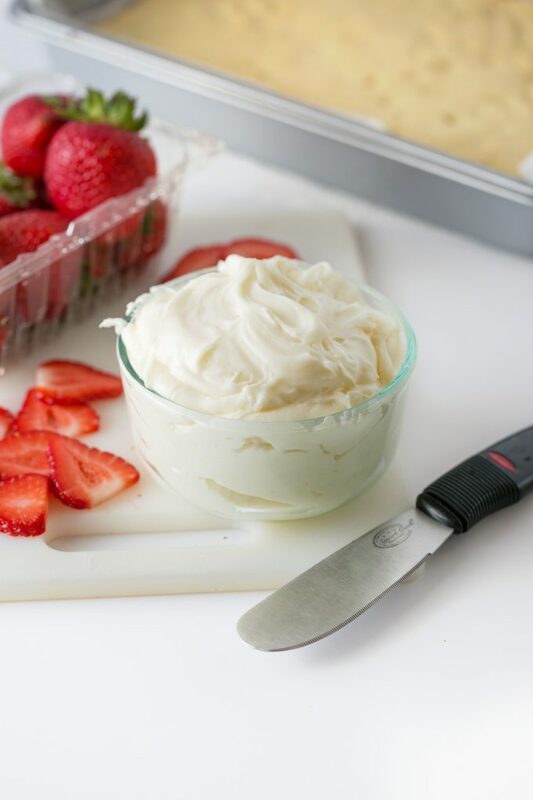 In a large bowl, beat the butter and cream cheese on medium speed using a hand or stand mixer (with paddle attachment) for 2-3 minutes (until light and creamy). Keeping the mixer on medium speed, slowly add in vanilla extract, lemon extract and powdered sugar. 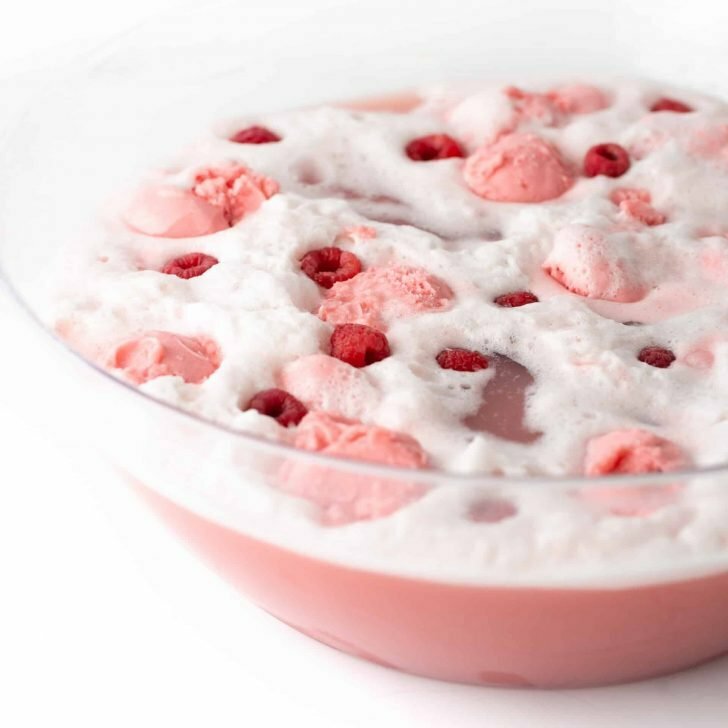 Once incorporated, turn mixer to high speed and beat for 2 minutes until light and fluffy. 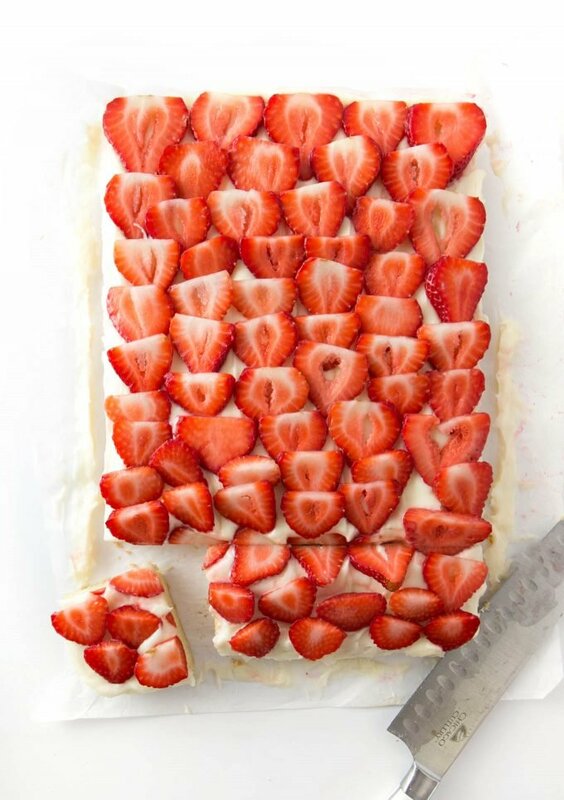 Spread on cooled bars and top with sliced strawberries. 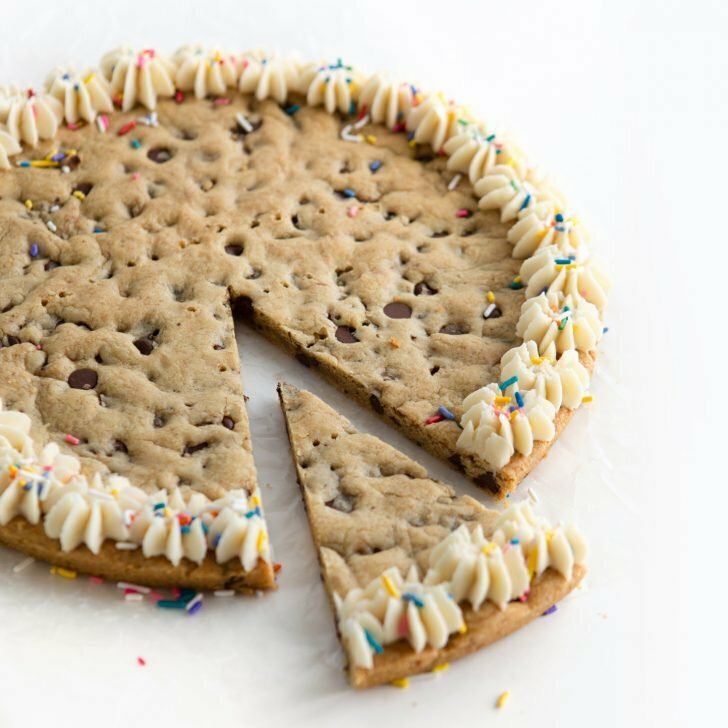 How many people does this sugar cookie fruit pizza serve? Depending on how large you cut the bars, this will serve between 15-18 people. How to make A Fourth of July fruit pizza? To make an American flag fruit pizza, simply make as directed then line the strawberries horizontally to create the stripes on a flag. Then leave the left top corner square open for blueberries. Want to make mini fruit pizzas? 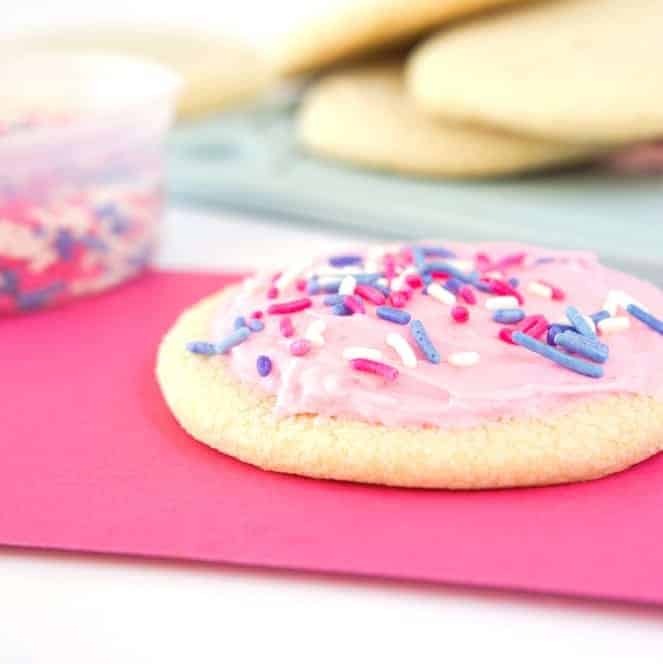 Instead of pressing into a 9×13 pan, turn these into individual sugar cookies by following my cut out sugar cookie recipe then topping with this cream cheese frosting. 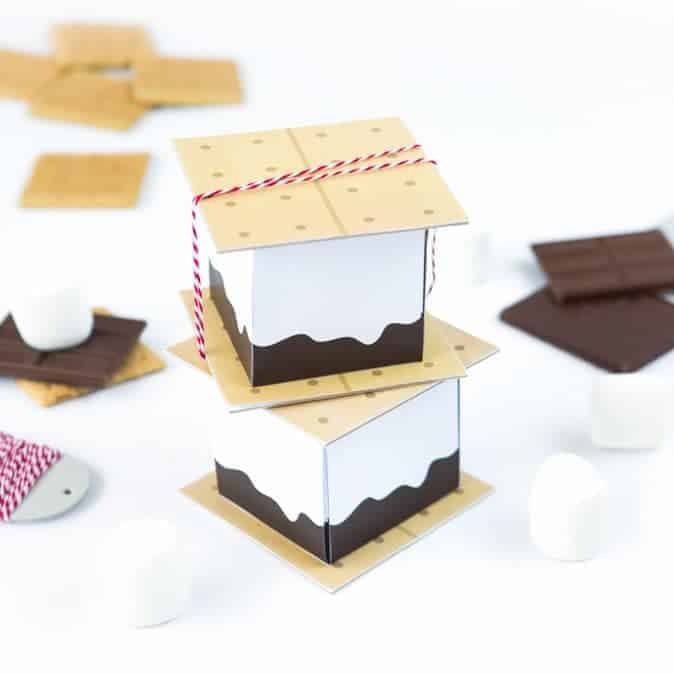 Can I make this in a jelly roll pan? 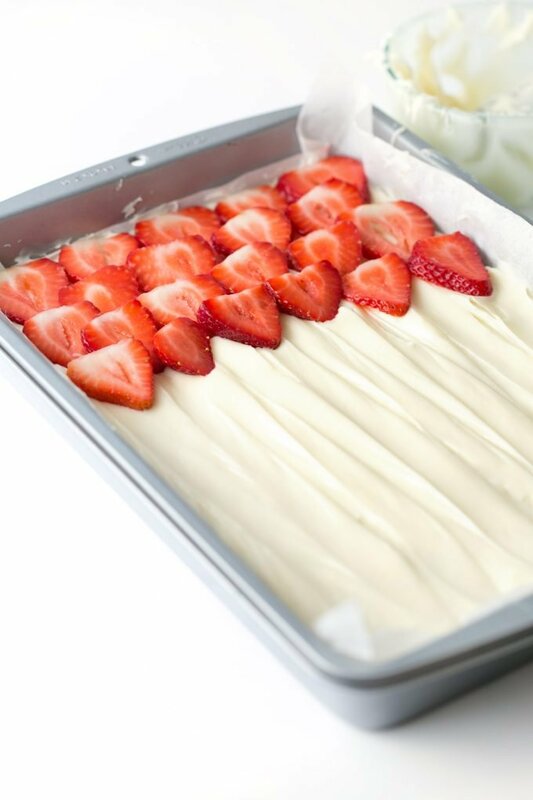 To serve even more people, double the batch and bake in a jelly roll pan. 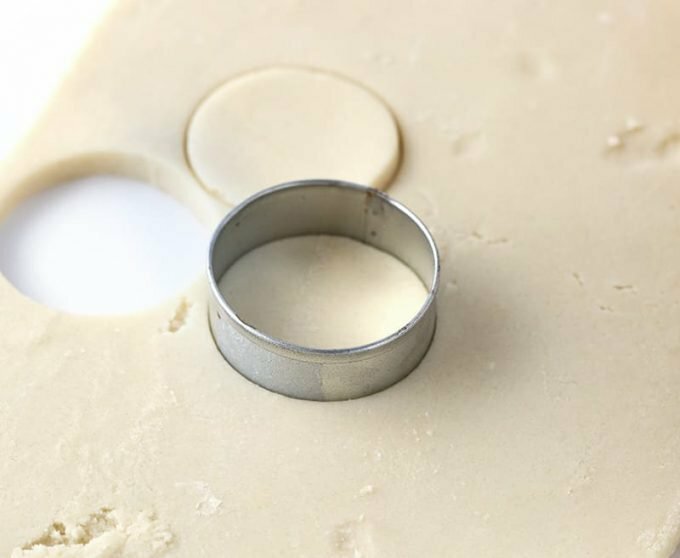 You will likely need to bake for a couple extra minutes since the mixture will be slightly thicker in a jellyroll pan. I’m very excited about this one! I can’t wait to try. Looks delicious! 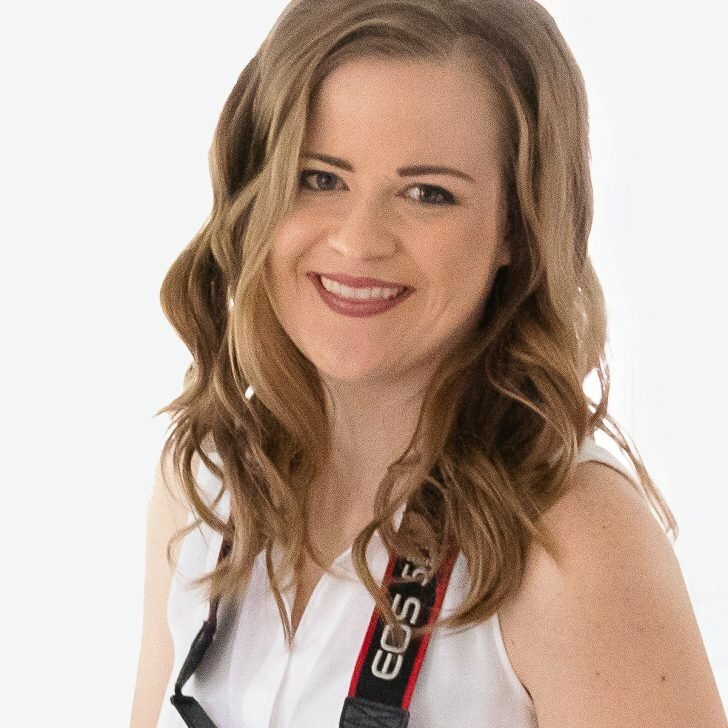 Thanks, Karly! If you make it, let me know how you like it! !